The secret behind the best vegetable soup is to simmer tomato broth and slowly build flavours, adjusting to perfection before vegetables are added. The process of adding vegetables late enhances the flavour without losing the texture of carrots, corn, green peas, green beans and celery. Only then do we combine the noodle shapes and barley to complete the wholesome nature of this delicious soup. 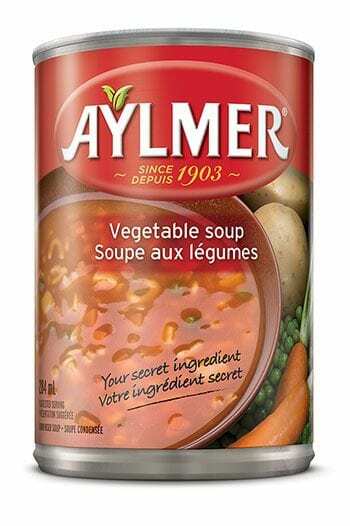 Many of our customers have shared the brilliant ways in which they use Aylmer products as the basis for creating their own soups… and you are invited to join them. Send in your favourite recipe here and we will be delighted to post it – with your name – for other Aylmer lovers to enjoy. 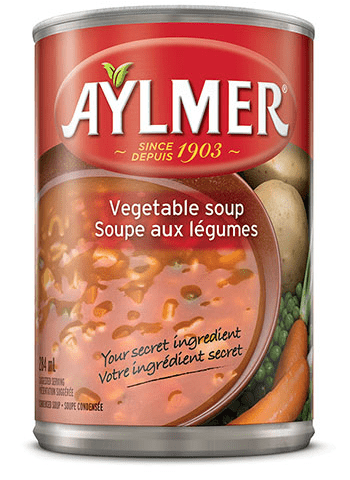 Prepare 1 can of Aylmer Vegetable Soup in a saucepan. Add a spoonful of store-bought or homemade pesto at the time of serving. Simply swirl in the pesto and enjoy the bold flavour and aroma. Add precooked mini (cocktail size) meatballs. Simmer 8-12 minutes until warm and serve. Shred or chop cooked rotisserie chicken. Toss in the chicken as you heat through.